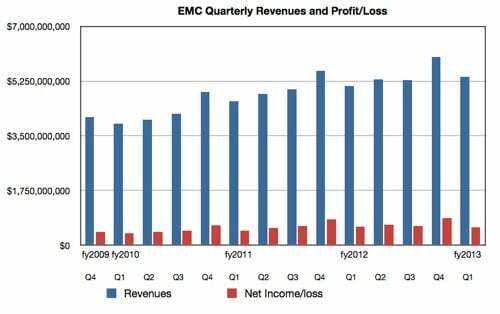 EMC announces record revenues: But hey, Joe, where're the profits? Hardware, virtualisation and services giant EMC has announced its first-quarter results for 2013 and while its finances are broadly positive, the devil's in the detail. EMC's revenues for the first quarter of 2013 were a record $5.39 billion - lower than Wall Street's estimates - and its profits were down by a smidge. The mid-range product segment also saw declining revenues. Net income for Q1 2013 was $580m, which compares somewhat poorly to income of $587m in Q1 2012 from revenues of $5.1bn. The profit, as a percentage of revenues, was 11.52 per cent a year ago - but it's down to 10.76 per cent in the latest quarter. What happened? EMC’s solid first-quarter financial results speak to the strength of our execution and the soundness of our strategy that offers customers greater efficiency, control, choice and agility. Our three federated businesses – EMC Information Infrastructure, VMware and Pivotal – are squarely focused on areas of IT that are expected to experience high growth over the next decade: cloud computing, Big Data and trusted IT ... I am incredibly energised by the strength of our business model and the way we have positioned the company to lead this transformative era in information technology. Well, yes, OK Joe, but where did the lost profits go? If we apply the percentage of profits-to-income for Q1 2012 (11.52 per cent) to the latest quarter's profits, this should have been $598m: ie, $18m more. It's perhaps notable that Q1 2012 saw $25.9m in restructuring and acquisition-related charges. In contrast, Q1 2013 saw $147.72m in similar charges, which would explain the lower profit. Information Intelligence revenues rose 7 per cent, a welcome return to growth after several quarters of decline. This last category includes Isilon, Atmos, VPLEX, RecoverPoint, ASD Suites, vFlash and the coming XtremIO arrays. We suspect Isilon powered most of that rise ... so, dear reader, have you detected the missing products yet? They're VNX and Data Domain, EMC's mid-range array mainstays. Revenues for them were not detailed in EMC's press release. What happened? In its results webcast EMC said this mid-range area, termed "Unified and Backup/Recovery", provided 33 per cent of EMC's revenues. Yet it declined 2 per cent year-on-year, from $1.41bn a year ago to $1.38bn now. Where was the damage done? In VNX or Data Domain - or even both? It's possible that this revenue decline accounts for EMC not meeting or beating Wall Street's expectations of its revenues this quarter. Another category, "Storage - Other and PS (Professional Services)" also showed a decline of 3 per cent, and this category provides 22 per cent of the quarter's revenues. The VSPEX reference architecture products have seen almost 2,200 sales since their April 2012 launch. VCE Vblock converged compute/storage/networking system growth was termed "strong" but not given a number. Revenue from partners in the Service Provider Program grew more than 40 per cent. VMware revenues grew 13 per cent. The third EMC business, Pivotal, has received a $105m investment from General Electric (equivalent to 10 per cent of Pivotal's equity, and EMC and GE are entering into "a broad research and development and commercial agreement aimed at accelerating GE’s ability to create new analytic services and solutions for its customers." Revenue from EMC’s BRIC+13 markets increased 10 per cent year-on-year. EMC expects overall 2013 revenue to reach $23.5bn with net income of $3bn. EMC's president and COO David Goulden said he thought EMC could be a $30bn/year revenue company in 2016.